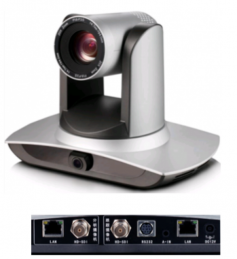 The TEK UV100T supports both Sony® VISCATM and PELCO commands with 120 presets, making this camera an excellent choice for large videoconferencing and lecture capture rooms. The camera can be setup for multiple resolutions and be ceiling mounted. Use both Sony® VISCATM and PELCO D/P Command sets to control the camera via joystick controller and room controller at the same time. For IP control the camera can use simple TC/IP VISCA commands and provide multicast streaming to a touch panel.